DolciDeleria: Beginnng the Harvest, or Free Onions! I ordered my onion starts from Dixondale upon the recommendation of Erica over at Northwest Edible Life ('cause, as far as this urban homesteading thing is concerned, Erica is everything I only wish I could be). I've never grown onions this large (which is weird to say, since I think that was one of the pull quotes on the literature that came with the starts. I guess there's some truth in advertising after all!). My Long Day Sampler of onions included white Ringmasters, red Redwings and these yellow Walla Wallas. According to Dixondale, the reds should have a storage life of almost 8 months, the whites about 4 months, and the yellows only about 1 month. 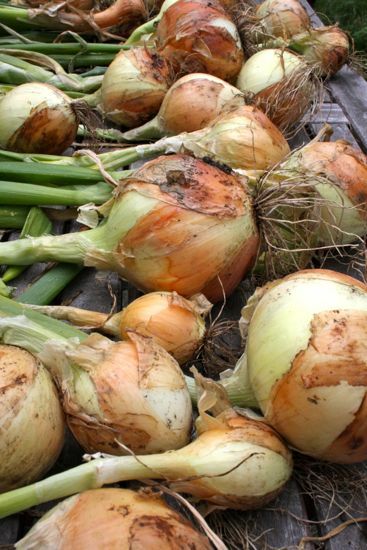 While we use lots of onions, I doubt I can use up all the Walla Wallas before mid September. Local peeps: ping me if you need an onion or two. I've got lots!